Mothers are celebrated in many countries on different dates and in different ways. Pamper your mum with our lovely Mother's Day Gift Set to show her how much you appreciate all that she does. 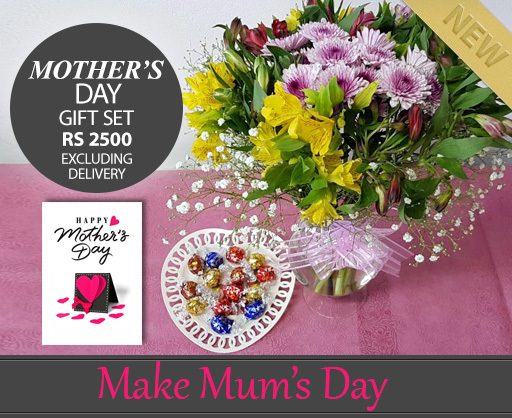 The gift set includes a mix of flowers including alstroemerias beautifully arranged in a glass vase, a chocolate platter wrapped and tied with a small bow and a FREE greeting card. Order your Mother's Day gift set today for delivery on or before Mother's Day. Edwige Boutique Florist will get extremely busy as orders for Mother's Day flowers roll in. In order to avoid disappointment, make sure that you plan ahead and place your order in advance. Same day delivery for Sunday 27th May is NOT available. Meaning you will not be able to order on the 27th May and have it delivered on the 27th May. So Please order in advance. Please note that on Sunday 27th May Mother's Day delivery time cannot be guaranteed. Your order will be delivered by 6pm.